The following is a list of background resource material potentially useful in the search for Bill Ewasko. Some of it is quite technical and likely unfamiliar to those without search and rescue experience. I am going to be a hardass and state up front I’m not going to explain it to you. If you can’t understand this stuff then perhaps it’s not something you should be involved with and you most definitely shouldn’t be wandering around in the field. This is a stitched screen capture showing all the search tracks as of October 14, 2011. The original search tracks are in black, and those of our post-search efforts since are in red. The location of Bill’s car is shown, where the bandanna was found and the main geographic features. 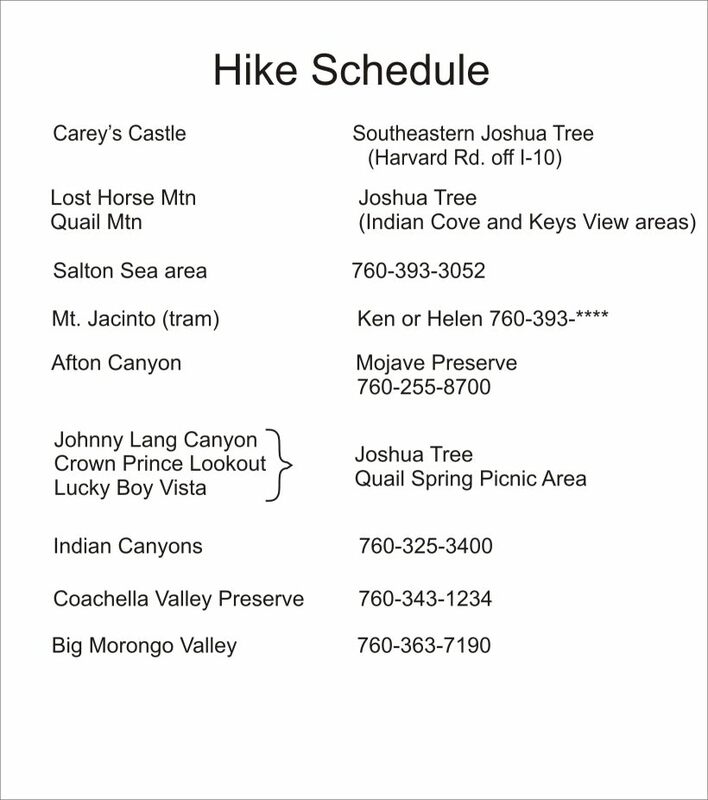 The traditional hiking routes to Quail Mountain are shown by dotted yellow lines. Finally, the 10.6 mile radius from the Serin Drive Verizon cell tower is identified. This is my summary of the events leading up to the start of the primary search for Bill. It’s taken from various official records and represents items I feel are pertinent for background. I’ve found it useful as a reference. Bill’s itinerary he left with Mary. I have a copy of the original, in his handwriting, but decided not to post the actual image. Instead, I created a transcribed version which essentially duplicates his, exactly as he wrote it. I did censor a personal telephone number for privacy. A tribute website for Bill created by his family and friends. Some information and pictures. The final JTNP Ewasko Search Map. It shows all the tracks up to the point the initial search ended on July 5, 2010. This isn’t the crappy image I took of it, it’s the real deal from the FOIA dump and very nicely done. It’s a big beast, so I compressed it a lot but it’s still a jpg file of 1.6 MBs in size. Here is a link to the JTNP page with lots of maps available as pdf downloads. Other than the overall park map with shaded relief, the Quail Mountain area isn’t well provided for. 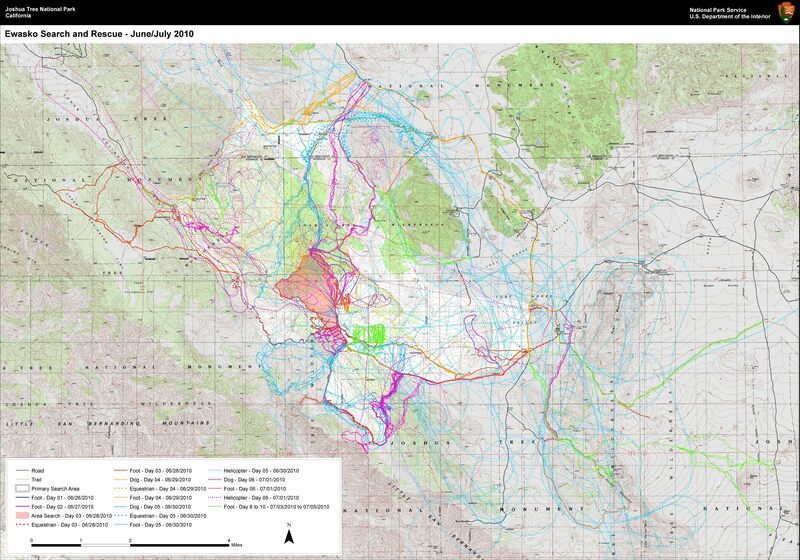 There is a map for the Juniper Flats Backcountry board (where Bill’s vehicle was found) but it really fails to show any of the geography to the west of it, including Juniper Flats and Quail Mountain! 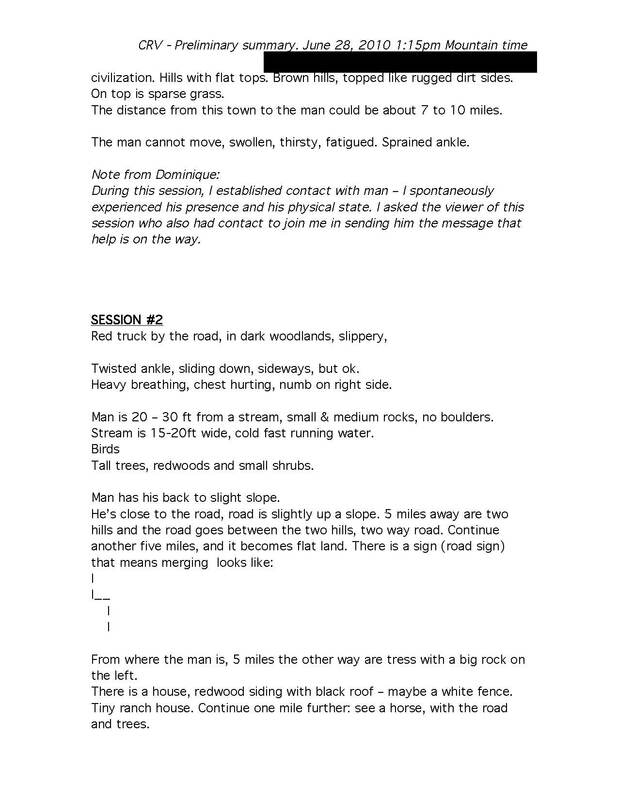 My discussion of the ping recorded from Bill’s phone I prepared for some of the people involved in the search. I’m not an expert, so it might not be 100%. Serin Drive cell tower splash map for Google Earth (kmz file): This map shows what areas have a direct line of sight to the cell tower that recorded the ping from Bill’s phone, as well as the 10.6 radius. It can be opened in Google Earth. Serin Drive cell tower splash map for Google Earth showing signal strengths (kmz file): A map generated using a different process showing signal strengths from the Serin Drive cell tower. Probably the more accurate of the two. The FOIA data dump from Joshua Tree National Park contained large amounts of irrelevant information, such as receipts for porta-potty rentals for the search. The following are extracts of the most useful and pertinent information from the official search records. Narrative: The entire case summarized with some diagrams and pictures. Incident Card: A very condensed log of radio and dispatch traffic during the search. Radio log: A written record of radio traffic received during the search. Contains coordinates for the few clues found. Tracks from the original OES search, saved as a 1.5 MB kml (Google Earth) file. All of our post search GPS tracks as of late November, 2012 as a 2 MB Garmin gdb file. Yeah, I know you’d like gpx, but it’s just too damn large that way. And if you don’t know enough to convert them using GPSBable, then this isn’t for you. Selected Serin tower cell zones approximately converted to GPS paths. When loaded onto a GPS, you can see the boundaries of the zone when in the field. Very handy. These are done as gpx files. 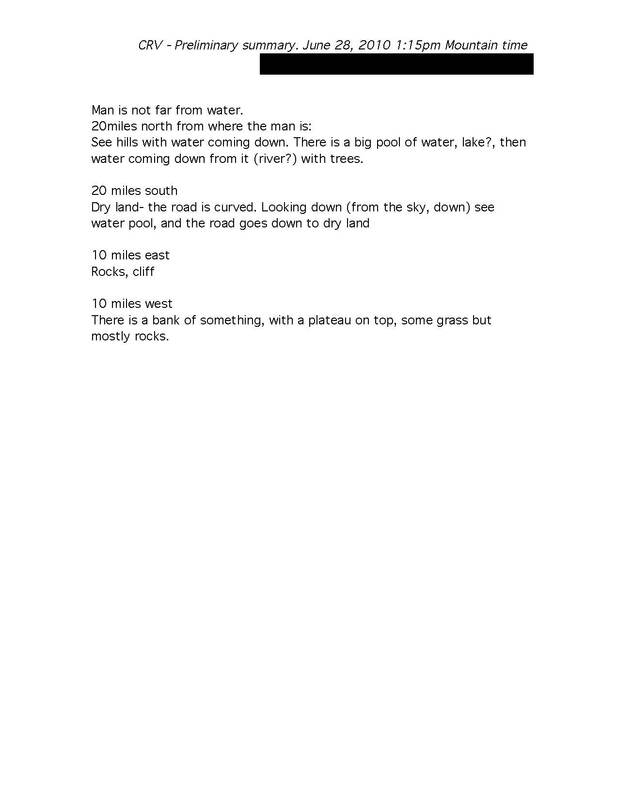 These were the notes submitted by two remote viewers who volunteered to provide their services during the initial search, provided to me by Mary. I should add that I have something more than a passing knowledge of remote viewing, and have seen it work amazingly well and also fail miserably. 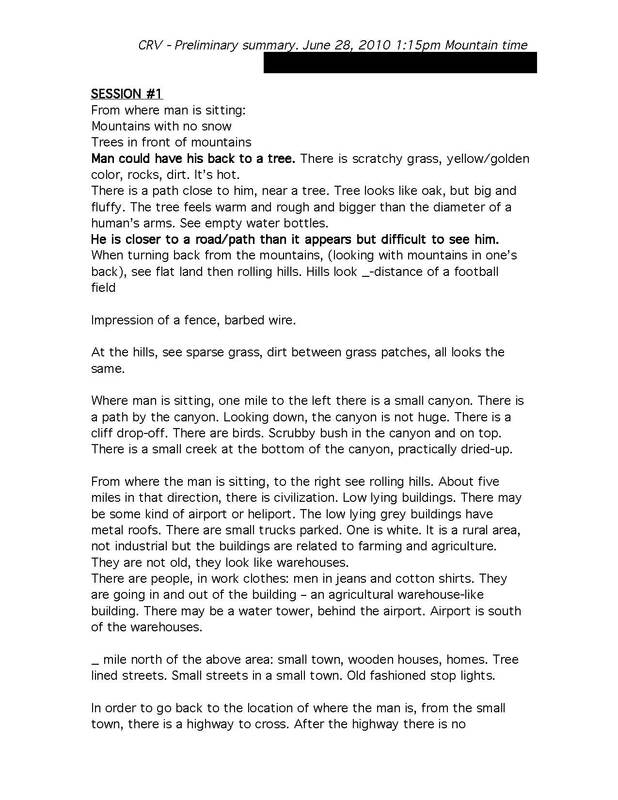 These notes are provided here as they were part of the puzzle. To me, one of the two viewers seems clearly off the mark, but the other has some interesting comments, but nothing I found specific enough to be of use in the field. The make/model of Bill’s Verizon cell phone (But I’ve been told it wasn’t a smartphone and didn’t have GPS capabilities). If the found bandanna was tested for DNA. What clothing Bill was wearing (although his backpack may be black). Any medical conditions Bill may have had.